Im Wald in privater Atmosphäre drei Meilen von Yellowstone Park eingebettet ist ein altes Blockhaus geschmackvoll restauriert, elegant eingerichtet und mit rustikalem Charme geladen. Das ist wirklich ein einzigartiges Objekt hervorragend in seiner authentischen westlichen Dekor und sicherlich einzigartig. Ein großes Blockhaus befindet sich auf 363 Autobahn 212 zwischen Cooke City und Silver Gate Montana, 3 Meilen von der nordöstlichen Eingang zum Yellowstone National Park. Wonderful, peaceful and quite. Very close to Yellowstone and Lamar Valley. Cabin is wonderful, very peaceful! Loved the outdoor deck—listening to Soda Butte Creek. Patricia was super nice and met us there to show us around. She has many books on Yellowstone and Montana to read when you are not touring the park or the Beartooth. Looking forward to returning! The cabin was clean and just wonderful. We stayed at the cabin for 2 nights and absolutely loved it. The cabin is very large, spotless, full of character and full of books with many cozy places to read. The kitchen is fully equipped with all the pots and pans you would ever need. There is a wonderful enclosed porch and a big deck as well.The setting is very peaceful and very close to the Park and the Beartooth Highway. We had friends visiting from out of town and they just loved it.Pat was there to greet us and gave us a warm, personal welcome. She is a delight. FYI The loft might be a bit tricky for someone older or small children. Other than that it was perfect and we hope to return again some day. This is a unique little place, but full of charm. Our kids, 5 and 8, loved the "secret" loft. It was their own special hideaway. The back deck was nice. I found the mattress in the main bedroom to be too firm, but we enjoyed our stay nonetheless. Arrived to an inviting fire lit. Which was appreciated, since it had been raining sleeting or snowing since we had left home 5 days earlier. 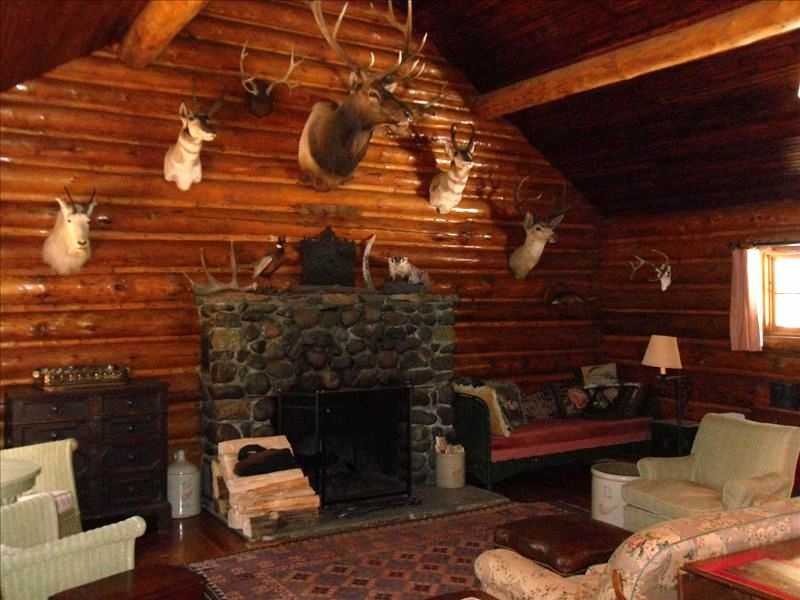 Home was a mixture of Uncle Buck's hunting cabin and Aunt Mimi's decorating. Kitchen has all pots, pans and dishes you could possible need. Microwave is in a pantry right off kitchen. We loved the furnishings, but be aware the taxidermy may be too much for some people, it is exactly as pictured. Wished it had been warm enough to use the sunroom and deck. They were both so inviting. But I must admit my favorite part of the cabin, was the soaking tub with handicap bars. I have arthritis in both hips and one hand, so to be able to come back after a long day photographing and soak in a hot bath with wonderful. Be sure to ride the little photo book with the history of Cooke City, quite interesting.